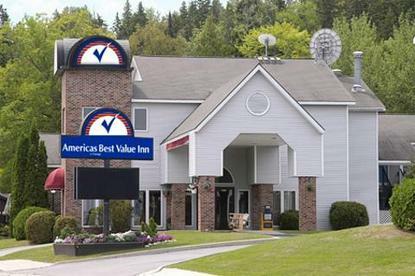 Americas Best Value Inn of St. Ignace is the perfect headquarters for your trip to the straits of Mackinac area and the Eastern Upper Peninsula. Come explore the beauty of the Great Lakes, Saint Ignace, Mackinac Bridge, majestic Mackinac Island, our Marina, numerous Museums, Annual Car Shows, Sunset Cruises, the Mystery Spot, Lighthouses, Castle Rock, and more. We offer 75 guest rooms, including some with 2 person Jacuzzi*s. All of our guest rooms are equipped with Wireless High Speed Internet Access, Mini Fridge, Cable TV with HBO, Coffeemaker, Hairdryer, Iron, Ironing Board, Radio, Alarm Clock, Complimentary Local Calls, and Wakeup Service. We also feature an Indoor Swimming Pool, and Spa. Copy and Fax Service is available in the Lobby for a minimal charge. Our Lobby and Front Desk are staffed 24-hours for your convenience. Please request Smoking or Non-Smoking at reservation or check-in time. Our friendly staff invites you to enjoy the value of staying with Americas Best Value Inn. .
Where to take my drone?